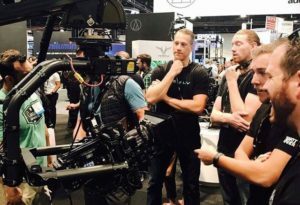 Home > Equipment Rental > NAB Gear Picks > Not Missing The NAB Show 2019, Are You? 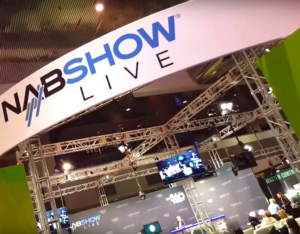 It’s that time of year again when we all fly to Las Vegas, not for a rowdy weekend of fun but for a little bit of both: The NAB Show 2019- The Story Starts Here! For years I wanted to write a crafty and fun guide to the show…well I FINALLY did it! Decided to make a video instead, the very first “NAB Survival Guide”. First, we leave Miami and get out to Las Vegas on Friday night to get ready for conference madness and prep by attending some pre-NAB parties over the weekend. For the second year in a row, Moving Picture is hosting its very own party, for a select few who rock the industry. Then, we’ll hit the ground running on the floor Monday morning, April 8th, to capture as much great content as possible for the “NAB 2019 Gear Picks- Highlights” VLOG. We’ll be releasing the VLOG on Tuesday, April 9 at noon on our youtube channel. Personally, I hope to virtually bring you to the show with our unique coverage! Full Frame Cameras for Digital Cinema – Fad or Here to Stay, @ 12:00 PM. With guests: Snehal Patel -Zeiss Sales Manager, Cine & Applications Specialist and Corby Martin -DOP, SIM International Lens Technician. Lighting for Cinema – Predicting the Next Decade, @ 12:30 PM. 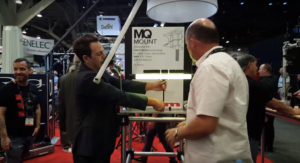 With guests: Paul Royalty – VP of Sales | LiteGear Inc, Derek Hammer -Gaffer / Owner, Hammer Grip and Lighting and Bradford Lipson, Director of Photography. During the entire week of NAB, we’ll be posting content from the show on our social media channels. So if FOMO (fear of missing out) gets to you, hop over on Facebook, Twitter or Linked-In and check out what we’re up to. Lastly, we’ll be publishing a blog post with the complete recap of the show on April 15. Our aim is to answer the main question: what did we learn this year at NAB?. Get a NAB Ticket for $50 with discount codes LV2738 or LV3969. Give us a friendly comment below if you do end up using these codes. Want Us To Report Back On Specific Gear? Alright! That’s a wrap-up! Follow us on social and stay tuned for more on NAB 2019. Full Frame Cameras: How Will They Affect Our Industry?